Project managers are responsible for developing and managing public art projects for the county, as well as advising on county requests for art and design enhancements. They also help educate residents and county staff about the importance of art in Arlington. “The work entails communication and project-related activities to publicize, advocate for, support and elevate the profile of public art and design enhancements in the County,” according to the job listing. 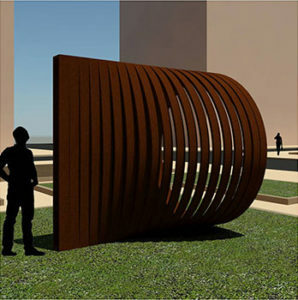 “The work also includes collection maintenance oversight for Arlington’s collection of permanent public art and portable works, the associated database and website, and supports the work of the Public Art Committee of the Arlington Commission of the Arts. Project managers work under Angela Adams, the public art administrator. The position became available after one of the former project managers moved to a different department to take a part-time job, said Jim Byers, marketing director for Arlington Cultural Affairs. Byers could not say who moved from the department because it’s a personnel matter, he said. The public art department website currently lists Deirdre Ehlen and Aliza Schiff as project managers. Those wishing to apply need to have a bachelor’s degree in an art or design-related field, such as fine arts, art history or urban planning. Candidates also need two years experience in arts administration, public arts or a design-related field.